Sneak a peek into the Top-Secret Personal Beeswax Journal of the outspoken and lovable Junie B. Jones. Featuring a tremendously loveable character and fun-filled songs, Junie B. Jones will capture your hearts once again, just as it did when you were in First Grade. The Kate Goldman Children’s Theatre at the Des Moines Community Playhouse presents “Junie B. Jones The Musical,” Oct. 23-Nov. 15, 2015. 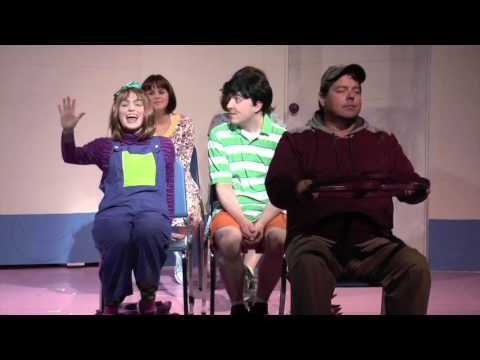 Tickets may be purchased online at dmplayhouse.com, by phone at 515-277-6261, or at the Playhouse ticket office, 831 42nd St. “Junie B. Jones The Musical” is sponsored by Nationwide. The Playhouse cast is directed by Anne Frett with musical direction by Brianne Magel and choreography by David Decker. The cast includes Michael Bundy II, Jason Crowley, Paige Fahrenkrug, Lindsay Mickelson, Taylor Millar, and Julianne Ungs. The Playhouse is one of the oldest and largest producing theatres in the US. Located at the 42nd Street exit of I-235, the theatre has presented a full season of shows since 1919 and also offers a wide variety of educational experiences including classes for ages 4 to adult, theatre trips to New York, and volunteer opportunities onstage and backstage. For more information about the Playhouse and “Junie B. Jones The Musical,” contact the Playhouse ticket office at 515-277-6261. Samantha Arneson plays the loveable Junie B!